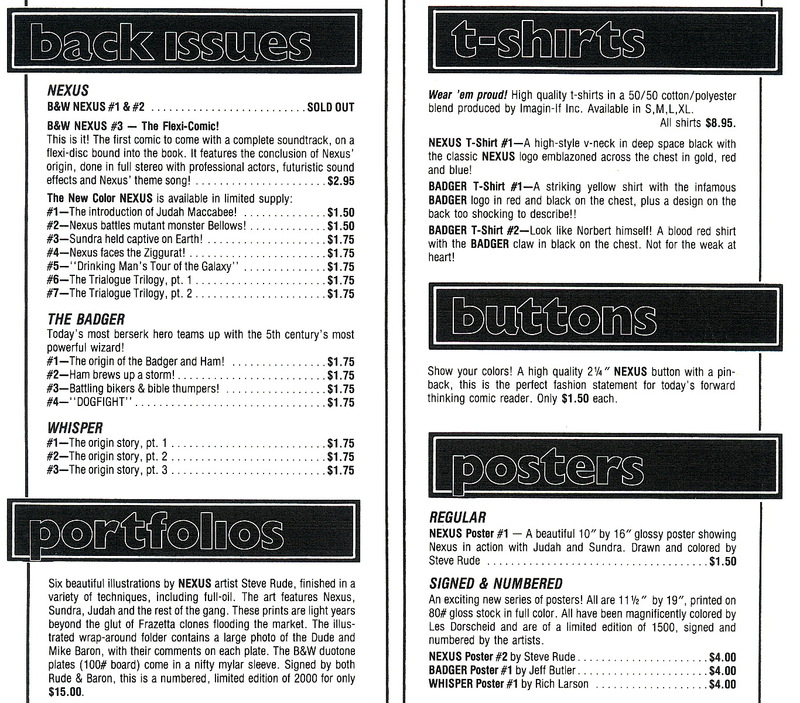 I wonder just how shocking that back design on the Badger shirt really was? And it took me a moment to remember…oh, hey, these comics never actually came out from Capital. 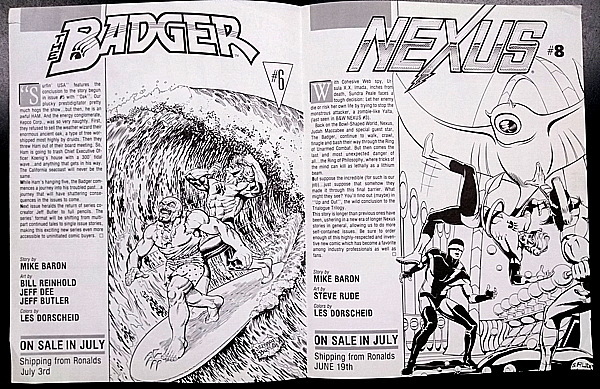 First Comics ended up acquiring the properties, with those issues of Nexus and Badger eventually coming out as-is, with the same numbering scheme (imagine that!) 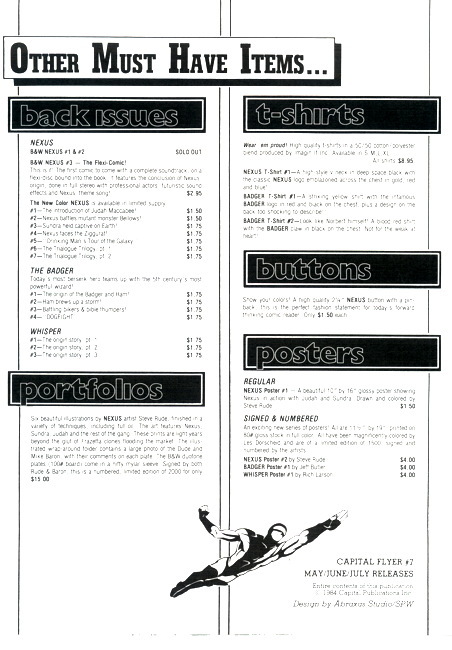 from First Comics in 1985. 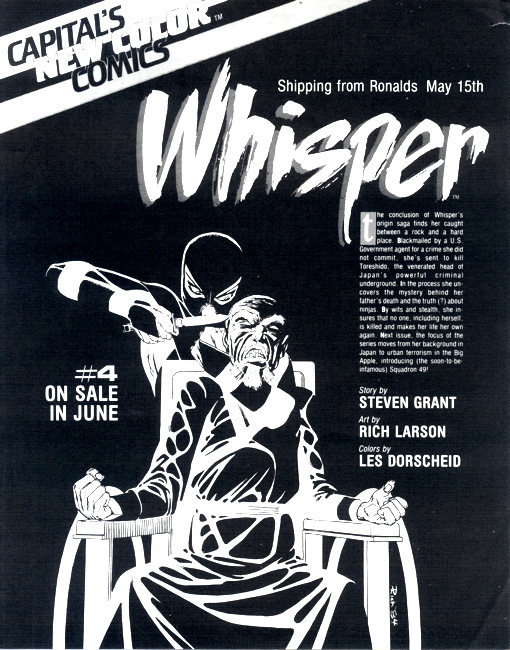 Whisper , on the other hand, while also coming out from First in 1985, instead picked up with the Whisper Special , wrapping up the story from the previous issues, and continuing on with a brand new series starting with a first issue. Looking back on this reminds me of just how close we were to these titles being tiny blips on the marketplace from the early direct sales days, if another publisher hadn’t arranged to acquire them. I know the rights issues behind this transfer was complicated…I don’t think the comics were strictly creator-owned, but I believe eventually they would be. Don’t recall the whole story, and I’m sure someone can remind me. At any rate, I’m glad the titles survived that initial setback and left us some nice long-ish runs to enjoy. Yeah, I know, given the way the market is now, they may have kinda sorta fell to the side, but for a while there it was nice to see some good ‘n’ weird superhero alternatives on the shelves that had a little wit and style. IIRC, Mike Baron only got the rights back after the Dark Horse guys gifted it back to him when Nexus and Badger turned up there. Whisper really needs to be collected. My memory is that the Capital issues and the early First material (through their anthology book) were solid, but when it became its own title at First, it got REALLY interesting. I remember plot twists and a thematic focus on issues of identity and some very interesting narrative techniques involving a “voiceover” set of captions that gave a different perspective than what the visuals presented. I may just have to dig those issues out and see how the reality fits that memory. I literally wore out the Badger shirt I had (#2, red with the claw on the chest). Aww man, I just got nostalgia bombed big time here. First Comics was my independent jam in the 80s-at one point in 1989 I was reading more First titles than DC and Marvel combined-and I loved all three of these books to bits. Whisper in particular; it likely was started to cash in on all the ninjas in the air in the early 80s, but around the time of the stories in First Adventures, it started growing into a very solid comic book. In fact, I think that’s what I liked about First. You had the occasional critically loved book-Nexus and the first year of American Flagg leap to mind-but the line was generally very, very solid and rarely disappointed. Until 1991 anyway.